New Website! • Obama A Psychic? • We Need Your Support! It's the week before tax day, and there's been a storm of activity at UFE. We launched a shiny new website—which you may have already gathered—with interactive features like user comments and social media buttons for ease of sharing. When you're done here, be sure to click around, let us know your thoughts and keep your online networks posted on what articles you liked (or didn't) on our new site. Why? Because money made from money should be taxed at the same rates as hard-earned wages. Taxing capital gains and dividends like work income would largely impact the wealthiest households, raising $84 billion to help keep schools, health care and other community services going. It's easy to get involved. Your pledged support enables groups like UFE and our grassroots Tax Fairness Organizing Collaborative members to do the work it takes to achieve progressive tax victories. [W]ithout even looking at a poll, my finely honed political instincts tell me that almost nobody believes they should be paying higher taxes. My first thought was that the President was having a psychic off day. Then it occurred to me that "almost nobody" could just be a passive way of calling out the very few, but very rich, corporatist elites—like the Koch Brothers—who throw their political weight around in the name of making more money. A 2010 Quinnipiac poll showed that of those earning more than $250,000 annually, 64 percent supported higher taxes on themselves, and 67 percent supported higher taxes on those with $1 million-plus incomes. Do you think - raising income taxes on households making more than $250,000 should or should not be a main part of any government approach to the deficit? Do you think - raising income taxes on households making more than 1 million dollars should or should not be a main part of any government approach to the deficit? It's truly frightening to imagine the kind of power we're up against; when the overwhelming majority of voters—including many wealthy ones (like Responsible Wealth members)—agree that we should raise taxes on the wealthy for the greater good, but we still have to fight tooth and nail to make it happen. And fight we will, because our families and communities are at stake. We hope you'll join us in the fight for tax fairness by taking the Tax Fairness Pledge today. While you're there, check out testimonials from other taxpayers at different income levels. We're still collecting testimonials, so if you're interested in being a part of this project, send an email to UFE's Communications Team at comms@faireconomy.org, and they'll send you a brief guide. INTERVIEW: Do Tax Breaks for the Rich Help the Economy? Responsible Wealth Director Mike Lapham joined Julie Dougherty and Ken Morgan, hosts of Money Radio's "Business for Breakfast" (Phoenix, AZ), to explain the failure of tax breaks for the wealthy, and to urge Arizonans to join RW's "Tax Wealth Like Work" campaign to tax investment income like wages. Take a Stand for Tax Fairness! 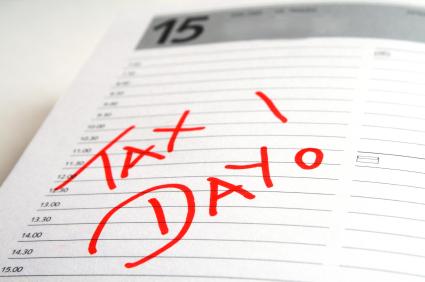 Tax Day is on Monday, April 18th! After you file your paperwork, take a stand for tax fairness! Amid the slew of recent and proposed budget cuts to programs that matter deeply to working and middle class families, we must reinforce the point that more revenue can prevent program cuts and reduce the deficit. Below is an 'activist's digest' of sorts which includes many notable events and resources related to Tax Day 2011! We are calling on Congress to tax capital gains and dividends at the same rate as income from work instead of the current rate of 15 percent. Sign on to our compaign, calculate your tax cut, donate your tax savings, or just watch the taxpayer testimonials. (You can even submit your own movie!) UFE is also asking people to call Congress to support Rep. Jan Schakowsky's Fairness in Taxation Act, HR 1124, which taxes millionaires' capital gains at the same rate as income from work, and adds higher income tax rates for millionaires and billionaires. US Uncut protests corporations like Verizon and FedEx which have dodged all or most of their U.S. income taxes at a time when lawmakers are cutting basic public services to address federal and state budget gaps. Many of these demonstrations will have a creative or fun aspect. Find US Uncut events near you. The U.S. Public Interest Research Group acitivities will be holding events outside of Post Offices on April 15 and April 18 in at least a dozen states. These events will target people whose minds are very much on taxes as they mail off their federal income tax returns. US PIRG will try to get Congress to address tax dodging corporations with report releases and post-carding. "On Tax Day, April 18, as millions of Americans patriotically pay their taxes, we will call on corporations and millionaires to pay their fair share. At hundreds of events from coast to coast, we’ll present tax bills to corporate tax dodgers for the billions of dollars their legions of lobbyists helped them avoid. We’ll organize a peaceful, dignified, and powerful day of action to call on corporations to pay their fair share. And we’ll demand that our elected leaders make them pay." (Their events appear to include the US Uncut events.) Find MoveOn events near you. Demos' Taxes Matter week provides a fresh outlook on how we think about taxes. Check out "Reclaiming Public Discourse on Taxes," which includes talking points and an informative webinar. Who can resist a great infographic? Have a look at Tax Breaks vs. Budget Cuts by the Center for American Progress. Or this comparison of budget cuts vs. tax cuts for the wealthy by the Economic Policy Institute. A few other organizations with excellent resources: Citizens for Tax Justice, the Center for Budget and Policy Priorities, and the Tax Policy Center. Please share this information widely with family and friends, send it to groups you are part of, and promote it via social media. Mike Lillis writes in The Hill about the challenge President Obama faces as he attempts to play to the center while appeasing ever-rowdier and more extremist Republicans. As he gets ready to unveil his deficit reduction proposal, he risks alienating his base, who if uninspired, may not contribute to his re-election campaign and even stay home in November 2012. While early reports indicate that Obama may include some good things in his proposal, such as ending some of the tax breaks for the wealthy and reducing military spending as part of his deficit reduction plan, other questions still remain. How strong will those proposals be? And will he include deep Medicare and Medicaid cuts? ..Liberal lawmakers already were irked with Obama’s decision to support upper-income tax cuts he campaigned against and to launch military operations in the Middle East without congressional approval. Rep. Peter DeFazio (D-Ore.) this week said Obama should start acting like a Democrat, while two left-wing grassroots groups warned their members could withhold funds from the president’s reelection campaign... The criticisms highlight the problem facing Obama, who is trying to lead from the center without alienating his political base. The White House strategy could help the president with independents, but risks leaving liberals at home in the fall of 2012. In addition to harsh criticisms coming from the Congressional Black Caucus (CBC), the Congressional Progressive Caucus (CPC) released it's own budget, "The People's Budget," to place a flag in the ground to the Left of Obama's centrist position. The People's Budget includes smart tax proposals: enacting a progressive estate tax, closing corporate tax loopholes, enacting a new set of income tax rates for incomes over a million dollars, and taxing capital gains the same as ordinary income. The plan also includes rolling back military spending and focusing limited federal dollars on job creation programs here at home and upgrading our nation's aging infrastructure. In addition to the new and stronger push-back coming from progressive in Congress, including the CBC and the CPC, outside organizing is underway to hold Obama accountable to his political base before it's too late. But the real question is, how hard will progressives push Obama from the Left? Are we willing to push as hard from the Left on Obama as the Tea Party and freshman Republicans are pushing on Rep. Boehner from the Right? In the end, as FDR said after his election and President Obama himself paraphrased, we must "make [him] do it." When it comes to taxes, not all income is created—or taxed—equal. Despite the time-honored value of rewarding hard work, our tax code gives preferential treatment to income derived from pre-existing wealth instead of income earned from work. Take the Tax Fairness Pledge now! Learn more about the special tax breaks for investment income. Use the interactive tax calculator, watch videos, and take the Tax Fairness Pledge. Read about proposals to end the tax break for capital gains and dividends. Read press release announcing Tax Wealth Like Work campaign. Follow coverage of our 2011 Tax Wealth Like Work campaign. See coverage from last year's Tax Fairness Pledge. In the US, the gap is widening fast between fewer and fewer rich people and everyone else. Do Americans care? Columbia professor and Responsible Wealth member Eric Schoenberg joined Warren Olney, host of KCRW Los Angeles' "To the Point," for a conversation about why wealthy and upper-income members of Responsible Wealth support raising taxes on themselves. Our current tax system rewards wealth over work by taxing capital gains and dividend income at a much lower rate than salaries and wages. UFE is calling for the restoration of the tax rates on capital gains and dividends to the same rate applied to income earned from work. Various proposals have been put forth to move in that direction. 1. President Obama's proposal to roll back the Bush income tax cuts for the wealthiest households. His proposal would restore the top income tax rates and the capital gains rate to their pre-Bush levels for those earning over $250,000. If the Obama plan were law, the top rate on regular income would be returned to 39.6 percent, while the top rates for dividends and capital gains would be 20 percent. This is a step in the right direction, but it only partially restores capital gains and dividends to the same tax rate as wages. First, capital gains and dividend income below the $250,000 threshold would still be taxed at a rate much lower than income earned from work. For income over that threshold, capital gains and dividends would still be taxed at nearly half the rate on income from work (20 percent vs. 39.6 percent). 2. Rep. Jan Schakowsky's Fairness in Taxation Act (H.R. 1124). This bill would create a new set of income tax brackets of 45% through 49 percent for income in excess of $1 million. The top rate of 49 percent would apply only to the very exclusive group of Americans with income over $1 billion a year. Capital gains and dividend income under the $1 million threshold would still benefit from the preferential rate, but similar income over that threshold would be taxed at full parity with wage and salary income. The Fairness in Taxation Act, including both the income tax rates and the capital gains and dividend rates, would raise $78 billion. 3. The Congressional Progressive Caucus' “People’s Budget.” This plan includes, among other provisions, taxing capital gains and dividends as ordinary income. The bipartisan Deficit Commission included the exact same measure in its December 2010 recommendations. Take action to support tax solutions for the 99%. VIDEO: What is a Loophole? What is a loophole? Can you hold one? And if you remove them from state budgets, what could we we actually pay for? Here's a radically moderate perspective on loopholes via video, courtesy of the Washington Bus, an organization that empowers young people through hands-on democracy. So many governors are hammering their budgets with a “we’re broke” message these days that it’s amazing our country hasn’t shattered into a thousand separate islands. More and more, however, rational voices are correctly asserting that we’re not broke. The problem isn’t that the United States is out of money. It’s that a tiny sliver of households are under-taxed. The richest 10 percent of Americans own almost three-fourths of the country’s total wealth. Astoundingly, the most affluent 1 percent of Americans own more than one-third of our total wealth. Thankfully, the message that our country isn't broke is making its way closer to the center of the tax and deficit debates. It can’t get there soon enough. Many Republican lawmakers, along with governors like Wisconsin's Scott Walker and Ohio's John Kasich, bizarrely think that they can erase deficits with tens of billions of dollars in budget cuts and tax breaks for corporations and wealthy people who don’t need them. They’re ignoring the greatest economic returns available, which are provided by public investments, federal aid to states, and even unemployment benefits. Instead of helping save the middle class, they're propelling us toward a busted, plutocratic disaster. The GOP's deficit obsession isn't just misguided. It turns a blind eye on the struggles of low- and middle-income Americans. In contrast, Rep. Jan Schakowsky’s sensible Fairness in Taxation Act would raise taxes on millionaires and billionaires, which better serves the American majority. Currently, families earning $374,000 pay the exact same federal income tax rates as families with multi-million-dollar incomes, or even the handful who earn a billion bucks every year, such as the heirs of Walmart's founder. The lifestyles of the ultra-wealthy wouldn’t change in the least if they had to pay moderately higher income taxes. And it would boost our national economy. The Fairness in Taxation Act calls for establishing five new tax brackets for incomes between $1 million and $1 billion, with rates ranging from 45 percent to 49 percent. The Illinois Democrat's bill would also address an absurd aspect of our tax system, which wrongly favors wealth over work. Today, money earned through working nine-to-five or the graveyard shift is taxed at a higher rate than money obtained through windfalls. Capital gains, dividends, and other investment income derived from pre-existing wealth shouldn't be taxed at rates lower than income earned through work. Three-quarters of all stocks and mutual funds owned by U.S. taxpayers belong to the richest 10 percent of American households. Therefore, some of the most affluent Americans actually pay lower effective tax rates than many middle-class Americans. Take, for example, a weasel like Lloyd Blankfein, CEO of Goldman Sachs. He raked in just over $13 million in 2010 (excluding his bonus of some $12 million worth of shares in his company). Of that $13 million, only his base salary of $600,000 will be taxed according to the federal income tax rates. The remaining $12.4 million will be taxed at a top rate of 15 percent. Unfortunately, Blankfein is just one example of the kind of gross inequity that exists in the current tax system. A century ago, tax policies adopted during President Teddy Roosevelt's administration were guided by sound principles that stand in direct contrast to those of today’s Republicans. “No man should receive a dollar unless that dollar has been fairly earned,” explained Roosevelt in a 1910 speech. “Every dollar received should represent a dollar's worth of service rendered--not gambling in stocks…I believe in a graduated income tax on big fortunes." The Fairness in Taxation Act takes aim at the same inequities Teddy Roosevelt--a Republican--identified long ago. If it were enacted this year, it would generate $78 billion that could fund jobs and social programs that Americans need now more than ever. Repeat after me: we're not broke. It’s time to mandate that the wealthiest members of our communities share in the sacrifice of the economic recovery and pay their fair share. The Fairness in Taxation Act offers a clear path in that direction. When corporations acquire too much power and influence, it threatens the air we breathe, the water we drink, and the health of our democracy. Amid the rising power and political muscle of major corporations in recent decades, the need to counter greedy and harmful corporate practices has grown exponentially. The contrast between executive pay and average worker pay is stunning. In 2009, CEOs of major US companies averaged 263 times the pay of typical American workers. Back in the 1970s, CEOs made 30 times average worker pay. To make matters even more galling, taxpayers subsidize these outlandish executive salaries to the tune of more than $20 billion a year through tax and accounting loopholes. In 2010, Congress passed major health care and financial reform bills, both of which contained small executive compensation related policies. The health care reform bill capped the tax deductibility of health insurance executive pay, and the financial reform bill required that all firms report CEO-worker pay ratios. Much more needs to be done and there’s no shortage of good ideas to reign in outsized executive compensation. One of the key tools for speaking out against rising CEO pay and harmful corporate practices is shareholder activism. In addition to legislation, it is one of the most powerful tools for advancing corporate reforms. Corporations are owned by shareholders, who can be individuals or institutions (such as mutual funds). If certain legal and regulatory requirements are met, shareholders are permitted to offer resolutions that get voted on at a corporation’s annual meeting. Shareholder resolution issues can be financial – e.g., executive compensation, predatory lending practices – or non-financial – e.g., board diversity, divestment from particular countries. Shareholder resolutions are only advisory, meaning that even if a resolution passes, it is not required to be implemented by the corporation. However, resolutions often put unwanted public attention and pressure on corporate leaders and, thus, are used as leverage to win shareholder demands. Read more about shareholder activism here.